Hello Gentlemen,here I will begin by the senior Order of Sierra Leone,the Order of the Republic. This Order was instituted in 1972. Here I can sho the insignia of the Officer of the Order of the Republic.I have the case of issue,so it's an Officer despite it's silver and not silver gilt. The case of issue is of beautifull green leather with Coat of Arms embossed on the lid & the name of the Order with its post nominal letter. It's a very heavy silver badge (69 grammes without ribbon & ribbon pin). That one was manufactured by Huguenin.Now they are manufactured in London again (but not by Spink). The case of issue is of beautifull quality red leather with the Coat of Arms of the country embossed on the lid. Here you can see the breast star of Commander,that one was made by Huguenin and is of metal gilt.The reverse is entirely gilded. The breast star of Grand Commander is entirely gilt on obverse. This is the insignia of the Officer of the Order of the Rokel.That one was made by Huguenin and it is in metal gilt. 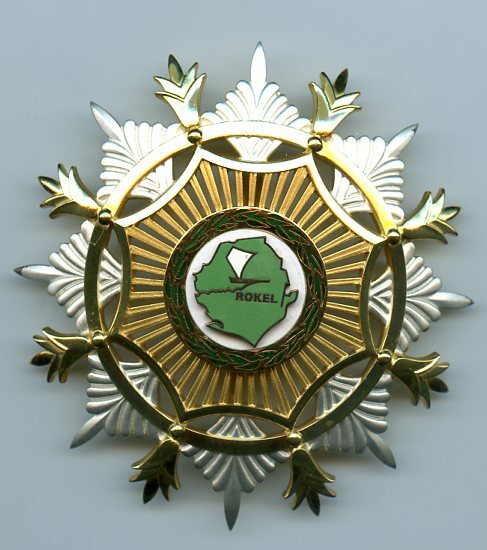 But long time ago,in 1999 a well known british dealer had a Commander of the Order of the Rokel in gold (price in 1999 was 1000 Pounds if my memory is good).I didn't bought it,but 10 years later I met the person who bought it and he was kind enough to show it to me.A superb piece very very heavy. 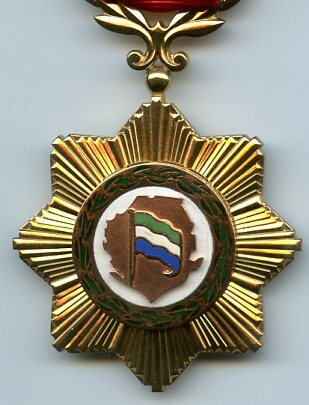 That's all I can say about Sierra Leone,but I'am sure there is plenty of fellow who will read these 2 topic and will post what they have.But please post medals in the Medal topic & Order in the Order topic to keep some logical order. If someone needs ribbon for the Order of the Rokel I have a few. Here is a set of the Commander of the Order of the Republic (breast star is silver) .Unfortunately it's not mine.But it's fo eyes pleasure. These are nice pieces, but the Rokel Order (even in gold) was a little bit expensive in 1999. I`ve got only one piece of Sierra Leone. It is the "First Anniversary Medal" in bronze. In the past I owned a similar one in silver; so perhaps there will be also one in gold? The medal comes in a small box and was made by Huguenin, Le Locle in Switzerland. if any one is interested in it, please let me know! 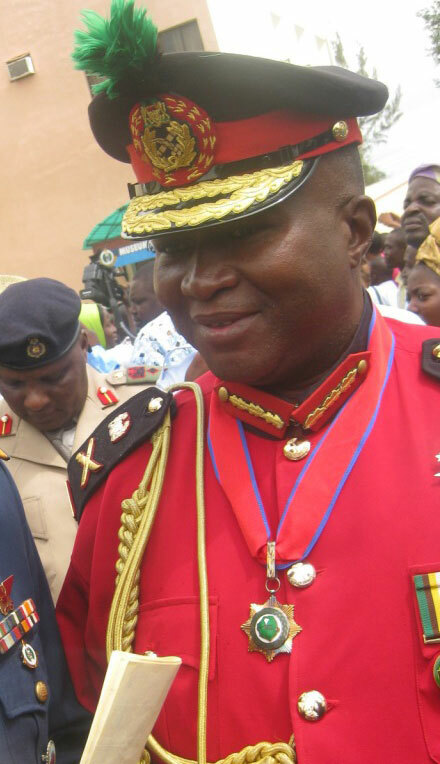 Brigadier General Alfred Claude Nelson-Williams the honour of "Grand Officer of the Order of Rokel" GOOR in recognition of his dedicated and meritorious service to the nation in the Republic of Sierra Leone Armed Forces on Friday April 2007. 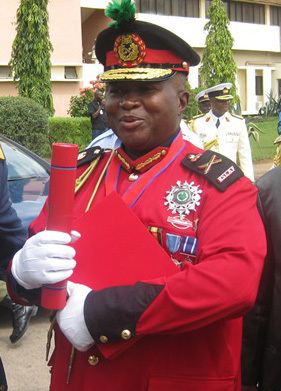 Major General Alfred Claude Nelson Williams GOOR, DSA, LSE, JSC, psc, FWC, ndu, MSC.